The Alexanderfeld youth group will hold a benefit supper from 6:30 p.m. to 8 p.m. Friday, Nov. 30 at the Hillsboro Senior Center. Singing will begin at 8 p.m. Donations for the supper of grilled chicken, gourmet potatoes, French bread, salads, and dessert will go to the Children?s Home in Wichita. 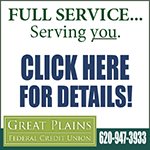 For more information, contact Glen and Bonnie Ensz at 620-947-5727. The public is invited to attend a Thanksgiving Day Service at 9:45 a.m. Thursday, Nov. 22 at Alexanderwohl Mennonite Church, located near Goessel. Marcia Brubaker will begin the service with 15 minutes of music on the Casavant Organ, followed by the worship service. Special music will be provided by local musician Richard Tirk, assistant professor of music at Bethel College. Tirk will perform on the trumpet and will be accompanied by Kyle Unruh, trumpet, and Karen Unruh, organ. The meditation will be given by pastor Lee Suderman. Grant applications will be accepted from now until Dec. 31. Details as to the process, criteria and where to direct questions are included on the application form. The city of Marion will hold its Christmas Parade at 2 p.m. Sunday, Nov. 25 on Main Street from the corner of Walnut to Fifth Street. Also on Nov. 25, a Pet Parade, sponsored by Animal Health Center, will be held at 2:30 p.m. in Liberty Park. Santa will be in his house from 2:30 p.m. to 4 p.m. as well as Dec. 8 and Dec. 22 from 10 a.m. to noon. The Central Park fundraiser quilt and baby afghan drawing will take place at 3 p.m. Entrants need not be present to win. The first $100 Christmas Cash drawing will be held at 3:15 at Santa?s House. Entrants must be present to win. Parade entries are still needed. For more information, contact Margo at 620-382-3425, or Melissa at 620-382-4223. Ebenfeld Mennonite Brethren Church, rural Hillsboro, will hold a Christian Endeavor program at 7 p.m. Sunday, Nov. 25. Roland Walter, a missionary in Spain, will speak about how he uses video productions to reach people for Christ. The program will also include singing and Bible verses by children, and a vocal duet. The Holly days in Hillsboro Christmas Bazaar and Bake Sale will be held from 9 a.m. to 2 p.m. Saturday, Dec. 1 at First Mennonite Church, Ash and Grand. Soup will be served from 11 a.m. to 1 p.m.
Crafters are invited to display homemade items at the event for $10 per table. 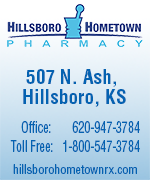 For more information or to register, contact the Hillsboro Chamber of Commerce at 620-947-3506. The Marion City Library has begun its Letters to Santa/Letters from Santa program. Children can bring their letter to Santa to the library during regular business hours, and will receive a return letter from Santa in time for Christmas. Letters must be brought to the library by Dec. 10, and should include your full name and complete address. For more information, contact Marion City Library at 620-382-2442. The U.S. Postal Service will hold two hands-on computer resource training seminars from 7 a.m. to 9 a.m. and from 5 p.m. to 7 p.m. Friday, Nov. 30 at the Hillsboro Public Library. The seminars will focus on Click-N-Ship and NetPost, two of the Postal Service?s premier computer resources. Seating is limited for the two sessions. To register, or to find out more information, contact the Postmaster at 620-947-3631. Mothers of Preschoolers will meet from 9 a.m. to 11:15 a.m. Tuesday, Nov. 27 at Parkview Mennonite Brethren Church in Hillsboro. Guest speaker, Jeanelle Herrel, will speak on hospitality. The creative activity will be Christmas wreaths. Enjoy fellowship and food. Childcare is provided. For moms who have never attended, the first meeting is free. Contact 620-947-2338 for more information. The Hillsboro Community Thanksgiving Service will be held at 7 p.m., Wednesday, Nov. 21 at Hillsboro Mennonite Brethren Church. A freewill offering will be taken for the Hillsboro Area Ministerial Association. A food offering will be taken for Main Street Ministries. For a list of needed items, visit the Free Press Web site at www.hillsborofreepress.com. The city of Marion will hold its Annual Christmas Tree and Candle Lighting Service at 6:30 p.m. Sunday, Nov. 25 at Central Park. Pastor Josh Wefner will give a short Christmas message. Following the service, hot chocolate will be served by the 20th Century club.